As an opening course we’re eating ripe avocado halves seasoned with lemon juice, salt, and pepper. The avocado halves were stuffed with an italian tuna salad made with vine ripened tomatoes, red onion, basil, truffle oil, balsamic vinegar, and parmesan. T: howdy. It’s been a while, I’m sure we’ve been reported missing in some states. A: maybe even the whole country! T: there are times in every blogger’s life when he (or she) must go several days without blogging. Sometimes this is due to a cross-country move. Sometimes this is due to a new job. or… a death in the family. Or the birth of a child. Or being audited by the IRS. In our case we went here. I’d say that’s a pretty good excuse! Unlike childbirth or getting audited. A: hehehe woah now, t-dog. we don’t want to piss off too many more mothers. Leaving the country is a good reason to not have posted in the last week. And i can guarantee it won’t be happening again too soon. These bloggers can’t afford to go on too many vacations! T: nope. not unless they are paid vacations. T: haha yeah. or if you don’t have anything for us to review and you want to just pay for us to live, that’d be ok too. A: yup. i’m gonna have to agree. that would definately be ok.
T: you know, it’s been a while since we’ve posted. We need to make this a hard-hitting post. So I’m going to start the discussion right here… did you see Tom Cruise and Katie Holmes’ baby? Like OMG it’s so cute. A: Like OMG, i can’t believe this is what you want to talk about on our food blog!!! and no. i haven’t seen the little babe. T: well you should really google the little tyke. Ok, what do you want to talk about? A: How about we start with this delicious antipasto we ate. huh??? i totally dug it. Tuna and truffle go sooooo well together. T: I totally dug the tuna portion too. The avocado part didn’t do it for me quite as much because there was so much of it and it had such a mild flavor. I wanted to eat more tuna, less avocado. A: Unless you want to smush up the avocado and add flavors to it, you really can’t get away from its mild flavor, in the whole form. I also wanted more tuna, which is why i served the bowl of leftover tuna along side the antipasto. it was there for you to add to it if you wanted to. T: and I did. But, I think you’re on to something with smooshing up the avocado. 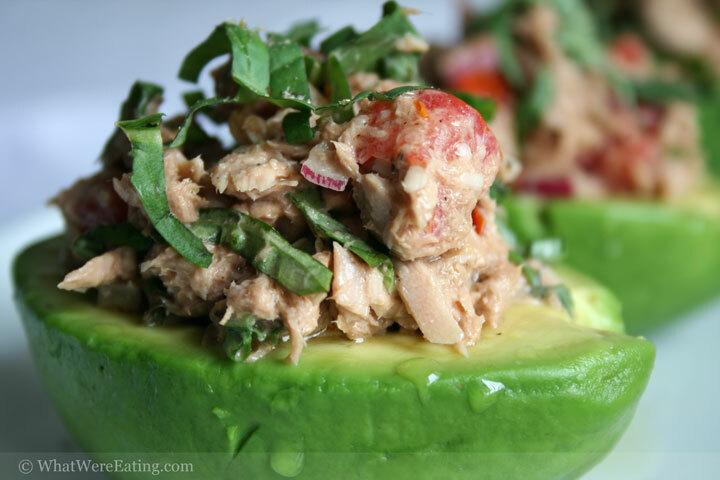 It wouldn’t have been as pretty, but you would be able to lower the avocado to tuna ratio. Maybe you could layer smooshed avocado and the tuna mixture on some other kind of cute apparatus. A: or if i had some damn ring molds, i could have made a cute little smushed avocado and tuna mold that would have looked fancy smancy. but sadly, i don’t have any ring molds. i’m definately going to have to save up and invest. they can make all the difference in the world when it comes to pretty plating. T: Are ring molds expensive? A: a set of them isn’t the cheapest thing in the world. and you definately need a set of them. T: don’t worry, baby. one of these days i’m gonna be makin the big money, and me and you’s gonna buy us some ring molds. And I want me one a’ dem big pretty clocks that does the bird chirpin. A: or maybe on of dem purdy ol’ fish that you put on the wall that sings to ya. i do bolieve that was a bass. T: right you are, it wuz a bass. I’ve seen bigger, but it wuz a bass. And man could it sing. A: okay. now we’re even scaring me. this has to stop!!! T: but baby, don’t you like dem singin bass? A: well, of course i like dem singin’ bass, but baby… this here’s a food blog! not a blog about fine things you hang on the wall. T: good point. ok. Well… where were we… ring molds… oh yes, the tasty tuna salad served in avocado halves. I give it a 4.4/5. Tasty tuna. Sadly I must deduct a few tenths of a point for the avocado not being the most thrilling thing in the world. What’d you think? A: I think there are avocado fans all over the world “boo”ing you right now. I guess i learned one thing from this venture: avocado isn’t your favorite food. Aside from that i truly enjoyed this one. I give the antipasta a 4.39/5. It was damn tasty and i would eat it again. This is actually the tuna salad that i was raving about a few weeks ago that i made for my breakfast/dinner after work one day. I just had to eat it again and blog about it. T: I do like avocados. I love guacamole. I also enjoy avocado by itself with some salt. I just thought there was too much avocado for the amount of tuna that was there. If you really like avocado I guess you would disagree, but as a person who likes avocado somewhat, this was my thinking. A: if i ever made this exact dish again, i could try to scoop out some of the avocado and make a bigger cavity to fill with tuna, thus higher tuna:avocado ratios! T: oooh good idea! I have another good idea. T: Actually, I don’t have another idea. I was hoping to think of one really quickly. Do you have any other good ideas? A: carrot cake! carrot cake is always a good idea! T: sorry. Let me try again. Say Mandy, where’s that carrot cake you keep talking about? A: i dunno, but i sure have a strong hankering for some! T: because if you leave it up to me it’ll be ramen for the rest of your life. Add the drained tuna, diced tomato, red onion, basil, parmesan, mayonaise, balsamic vinegar, and truffle oil into a mixing bowl. Mix the ingredients thoroughly, then taste and season with salt and pepper, as you deem necessary. Squeeze lemon juice over the peeled avocado halves, then lightly wipe off excess lemon juice with a paper towel. Slice a small sliver out of the rounded bottom of each avocado half, so that during plating the avocados will remain upright. Place the avocados on a serving tray (or individual plates) and sprinkle them with salt and pepper. Scoop the tuna mixture into the avocado "bowls" and garnish by drizzling with truffle oil and sprinkling basil ribbons. Serve at room temperature or chilled. Enjoy! hooray for canned fish! that looks so delicious, how ever did you peel the avocados so perfectly?! beautiful picture too, i just want to gobble that up so bad right now. damn! Lea, i’m sayin’ it is so! I just love avocado too. Woooo Hooo! go canned fish, go canned fish, go! Aria, i think perhaps the two of us can start a canned fish revolution. the trick to pealing the avocado like that is to find a ripe one, cut it in half then just carefully peal away the skin with your hands. a knife is way too brutle. I posted something quite like that a while back. Yours looks WAY better! and you don’t need ring molds! That looks fabulous just as is. Just wanted to let you know I’m including this as one of my South Beach friendly recipes of the Week on my blog today. It includes your photo (with a photo credit for you, of course and a link to your recipe. Looks fantastic! We tried a twist to this. My husband and I don’t care for Tuna, so we used crab. YUMMMM!! !, though I agree with Ty that the Avocado is a little much.